I take a swig of water, feeling refreshed afterwards. I continue trekking for another 5 hours. This is how some of our hikes have gone. We have only hiked 3 or 4 times, but they have all been long. 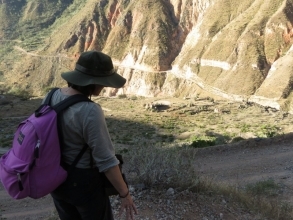 We had a 3 day trek into Colca Canyon, the second deepest canyon in the world. We trekked through the mountainous “desert,” with cactus abounding. A week later, my family and I walked 14 kilometers with a group one day, stopping to eat lunch at a local’s house. Yesterday we hiked up the mountain “Picol,” leaving our house at 6am. It was a good hike and we arrive at the top at 11am. Picol mountain is 14,500 feet high, taller than some of the Rockies. But the hike wasn’t that long, as we are already at 11,000 feet of elevation. It was fun to see some spectacularviews and be reminded of the small speck that we are on the world. Cusco is a brilliant city that has lots of culture. It has been really fun. The last few weeks, we have home schooled for 5 hours a day. Unfortunately, we are not as fast as those who are in classes at home, so we our summer is integrated into living. There is no 2 month break. We are enjoying this incredible opportunity though, and are grateful for our support at home. We leave Peru on July 4. Happy summer to my friends in Asheville! Must feel like you are close to heaven at times, Adam. The scenery must be gorgeoous. Hope everyone is dealing with the rarified air well. Haven’t heard anyone complain. Had the acolytes down for a “Waterside Picnic” on Sunday. The boat performed beautifully and gave them some thrilling tube rides. Can’t wait for you guys to ride it next year. Had a great trip to NYC to visit John and Gae and family. Had a great time! Watched the Nats beat the Yankees and even hit a grandslam homerun. All is well here. Hi to all. Send us more pics. Have fun! You are already seasoned hikers by the time we get there! We just visitet Verdon Gorge in France a month ago – their deepest canyon, but Colca beats it i am sure.